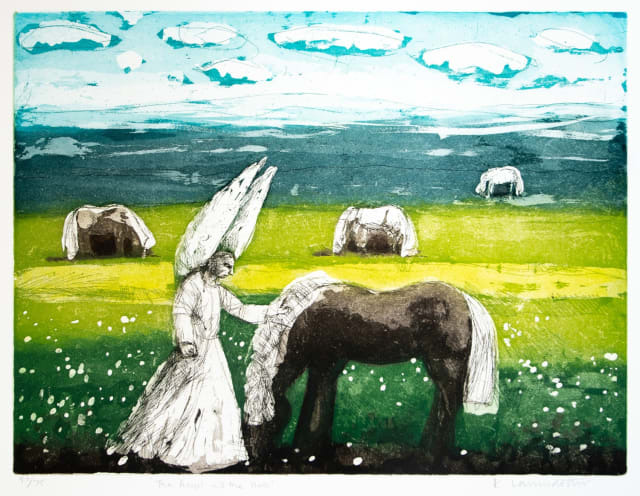 Originally from Iceland, Karólína's prints and paintings are evocative of a childhood filled with native characters and customs. Karólína's grandfather owned the first grand hotel in Reykjavik, Hotel Borg, and many a childhood holiday was spent there, providing a lifetime of inspiration for her work. Prints are often populated by chefs and chambermaids or people taking tea or soup. Their faces are unsmiling, yet expressive and intense but never dour, relating to one another as if in silent understanding. In other prints we are privy to a strange ceremony or gathering, where angels are occasionally present; scenes that are part of the mysterious world of adults and their subtle exchanges and inscrutable conversations as witnessed by a child. Born in Reykjavik in 1944, Karólína Lárusdóttir studied art at the Ruskin School of Art in Oxford, graduating in 1967. She remained living in the UK until recently when she returned to her homeland of Iceland. During her career she became an elected member of the New English Art Club and a fully elected member of both the Royal Society of Painter-Printmakers in 1986, and the Royal Watercolour Society in 1996. She won numerous awards, including The Dicks and Greenbury in 1989, and the 4th Triennale Mondiale D'Estampes Petit Format, France. In 1990, Karólína received a special award at the Premio Biella Internazionale per L'Incisione in Italy, and she was nominated graphic artist of the Year 2005, Islensk Grafik (Icelandic Printmaker's Association) and was the recipient of the Aberystwyth University School of Art Collection Prize 2012. She exhibited in numerous galleries all around the UK and in Iceland, including at The Royal Academy Summer show. Her biography was published in Iceland in 1993.